Expectations from summer internships differ across a cohort of students. Some folks are excited by the idea of spending their stipends on everything they have always wanted, others want to network with professionals, some, only have an eye on the golden goose – The PPO . Very few, however, want to learn and have fun. Along with a few others, I fell in the last category. Right after I got to know I would be joining Mahindra, like any other summer intern, I spoke to many professionals associated with Mahindra, to see if my ideas would be appreciated here. These conversations got me fairly excited about working here. Some seniors would tell you that summer internships are like two-month long interviews and this causes people to become anxious. Mahindra did everything to not make us feel anxious during the induction week. Leaders from different Mahindra sectors wonderfully illustrated how their business brings the RISE philosophy to life. The “deck-less” talks were rather appreciated by all GMC interns. If you ever meet a GMC of Batch 2019, do not fail to mention the talk by Mr Hemant Luthra, especially on the subject of acquisitions, you will not regret it. It was very obvious that all of the speakers carried within themselves, such confidence about the work they were doing on taking their businesses to new heights, that it was infectious. 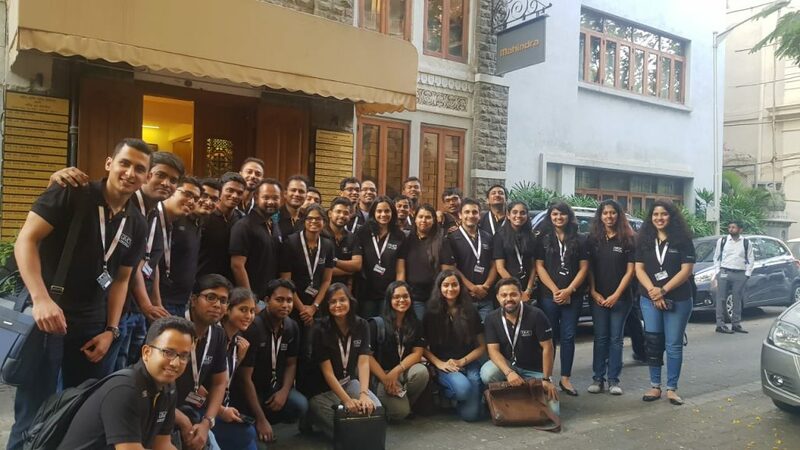 The three-day induction also gave us a glimpse into the AFS sector at their Kandivali office. What stuck with me, was the session with Mr Veejay Nakra, who heads sales and marketing for the automotive division. I was sold by his exemplary rendition of the branding tale for each newly launched vehicle in the past year and how such launch strategies are formulated. An interaction with Mr Anand Mahindra will be forever cherished. I had just read his tweets before and felt them to be insightful, humorous and courageous enough to touch the topics that socially mattered. I was expecting our discussion to be fun as well. And lo and behold, I was not disappointed at all. We discussed the qualities that we admire in our leaders, what our purpose in life is and the perils of digital stimulation that millennials feel in their day to day lives. Not only was he charismatic but a phenomenal listener, something that makes one feel important as an individual. This is the unique skill that aids leaders drive change. He stressed on the importance of being open to learning as well. In addition to this, fellow interns I met were also interesting. Their questions to speakers showed that they had taken the effort to gain insight into the Mahindra companies. We quickly worked through the initial awkwardness – a trip to Marine Drive fixes it all, isn’t it? We had a great time having conversations about our future, our political views and our anxieties. What better way to connect to people?! All of these folks were quite reflective and approached life with a certain passion that can make one feel like the future is in the right hands. It is a pleasure to be surrounded by such curious minds. My first day on the job was quite comfortable. I was to work on a project in the Group-HR function at Mahindra Corporate office. When one enters a new organization, some of us grapple through the murkiness of unknown social standards – what is socially and formally acceptable? I did not feel like I had this phase in Mahindra beyond the first day. People were so warm and accepting on my floor. All my tech needs were taken care of, and systems were in place when I arrived. I later came to know that employee experience is taken very seriously here and they make sure they are thinking about what a newcomer will need on their first day. Raghav (my mentor) gave me a brief about where exactly in the business is my project located (believe me, this is quite a task too). Knowing your sector and your business context is the key to execute your project well. Each of us was also assigned a buddy, to help us understand the organization better and make us feel comfortable in a team. My buddy Shefali, has this calm and composed demeanour that instantly made me feel like I was in control as well. I realized that my team was setting me up for success, for sure. By the end of the first week I was attuned to the vibe of the place, I felt that I already belonged to the team. Eventually, you treasure the people you work with, above most other workplace things. I had decided on the weekend that I would pace my project well and who knew that Raghav had it planned so well too! When I had the project context setting meeting with him, he made sure that I knew why we were doing the project in the first place. Having worked in various fieldwork organizations at TISS, I instantly notice efforts like these. I had never worked in L&D in the past and Raghav was proactive, accessible and supportive. A mentor and buddy with genuine concern for the mentee are treasured beyond measure. For me, this would be my first experience of the L&D function, and the team made sure I have a positive one. Here’s to starting a joyful journey at Mahindra! Mugdha is an ambitious cat-loving person, always searching for a silver lining. She draws her energy from the time she spends with close friends and values them. Her alter ego can drop really inappropriate comments but she looks darn prim and proper doing it. Don't be surprised if you see her talking to a cat on the street or sniffing around for a learning opportunity.